Ooh-la-la I’m in love! 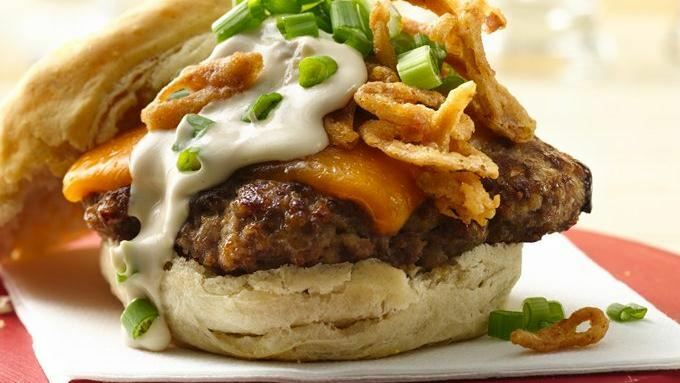 This burger is topped with French-fried onions, yummy melted cheddar cheese, and sour cream all coddled lovingly in a Pillsbury Grands! Flaky Layers refrigerated biscuit. It’s an affair to remember! An easy make at home variation on a stadium favorite sour cream and onion burger. Heat oven to 350°F. Make biscuits as directed on can–except sprinkle tops of biscuits with cornmeal before baking. Cool biscuits slightly; split. Set oven control to broil. In large bowl, mix beef, 1 cup onion dip and the bread crumbs. Shape mixture into 8 patties, about 1/2 inch thick. Place patties on rack in broiler pan. Broil with tops 4 to 6 inches from heat 6 minutes; turn. Cook 5 to 6 minutes longer or until meat thermometer inserted in center of patties reads 160°F. Add cheese slices during last minute of cook time to melt. Top burgers with French-fried onions, green onions and 1/2 cup onion dip. Serve on biscuits. This entry was posted in Fun In The Sun. Bookmark the permalink.